Info "Combine our powers and blast off!" On-Line is one of Dribble & Spitz's microgames in WarioWare: D.I.Y. Showcase. There are three robot parts flying. 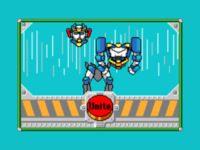 The player must press the "Unite" button in time to make the three parts combine with each other. When the button is pressed and some of the parts are separated, the game is lost. This page was last edited on October 8, 2018, at 21:08.